Taken with Olympus E500 digital camera October 21st 2007. Click image for larger view. The weather has been very bad the last few days here in northern Norway so I welcomed this opportunity to photograph the small opening in the heavy layers of clouds. Maybe I should go outside and photograph the bad weather? That’s pretty awesome. How did you take your meter reading for this one? 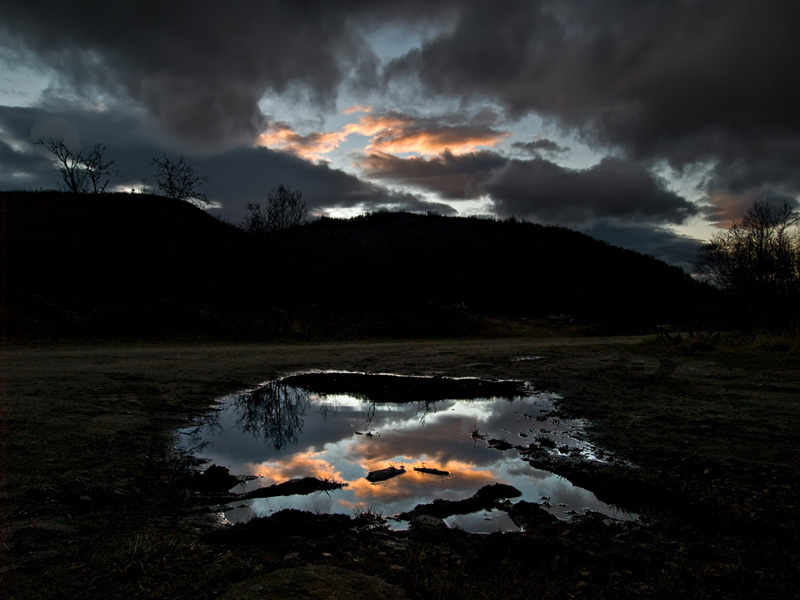 I’m wondering because the sky is brighter than the puddle, while the landscape is very dark overall. Tricky setup. I did my meter reading on the lightest part of the sky so it wasn’t blown. I then made 2 layers from the raw file where I adjusted the exposure to fit both the puddle and sky and slapped them together in photoshop. I agree – the colors in the puddle are brighter and more beautiful than the actual clouds! Great job! You should consider getting and underwater housing for your camera. That way you can take it outside in any kind of weather to shoot photos without damaging your camera and lenses. I’ll bet you could get some spectacular shots that way during stormy weather. Great shot Thomas, the refection is amazing in this. That is an astounding Picture, It’s soo beautiful. It would look great on a postcard. This pic is so cool, I’m using it for my desktop! That is absolutely gorgeous. Thanks for stopping by! I’ve added you as a contact and joined your community. Your photography is awesome! I just posted a puddle reflection today… how neat that I found yours the same day I posted mine. This is just BEAUTIFUL! Your photos never cease to amaze me! Keep up the great work Tom. It is really more beautiful than reall clouds. Absolutely gorgeous image! The exposure is simply perfect.